Impressive game, very entertaining and challenging. FIRE - level A-Z: too tough? So what are you waiting for ? Click here to download FIRE ! For more information about FIRE, click here. 5 images plus 2 in wide screen. 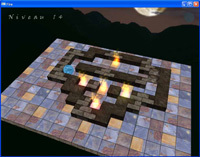 New screenshots of the game FIRE in 2008.